Welded construction for long and reliable service. 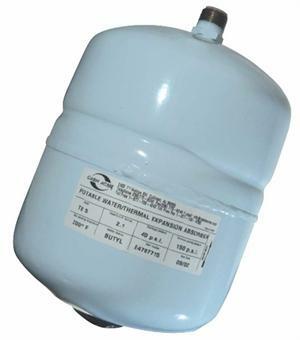 Heavy duty butyl diaphragm for use with potable water. The tank connection has a plastic sleeve to protect against corrosion along with internal coating of the steel shell. All models are factory pre-charged to 40 psi. Domestic hot water heaters. The TE tanks take up the expanded water from a water heater when a backflow device is installed on the heater inlet. The TE Series is certified to NSF-61 and IAPMO PS88, and is listed by NSF and IAPMO.